Dig below the franchise food bars, selfie-stick vendors and bridal stock-shot locations, and China’s Yunnan Province still has plenty of cultural history to see and experience. By Kayti Denham. Lijiang Park draws tourists galore but what of tourism impacts? KUNMING, June 2017. Yunnan Province in southwest China borders Vietnam, Myanmar and Laos. It is a region of intense beauty and contrast with its cultures influenced by mountainous tribal communities from the Bai, Yi, Naxi and more recently Han migrants during the WWII occupation of China by the Japanese. Gaia Discovery visited Yunnan destinations at Dali, Lijiang and Shuhe recently to weigh up the pros and cons of the Province as a destination for eco-aware travellers beyond the tide of tourist tat and faux tribal crafts. The city of Kunming sits at the gateway to the region, and is being developed for domestic as well as overseas tourism. It boasts major festivals such as the International Cultural Tourism Festival and more famously, stunning wedding photos besides vast lakes, in winding streets and on cobbled bridges of the old towns. Outside the urban scenery, it also offers stunning vistas on the roads that head to the Jade Snow Mountain National Park and dramatic rice field terraces of Yuanyang County and Old Yungyiang town. While there is plenty on offer on the well beaten track, getting off it was an eye-opener for the diverse and rich culture that has slipped under the radar of domestic tourists armed with selfie sticks and shopping bags who descend on “Old Towns’ in a frenzy of costume changes and credit cards. The first thing we discovered, and were a little surprised by, is that the majority of people working in tourism didn’t actually seemed that pleased to see us. Compared to the welcome in countries from Indonesia to Laos, the tourism staff in China seem initially non-committal. A smiling enquiry might see a curt response, but once beyond the ‘efficient’ veneer most revealed themselves as warmly welcoming. 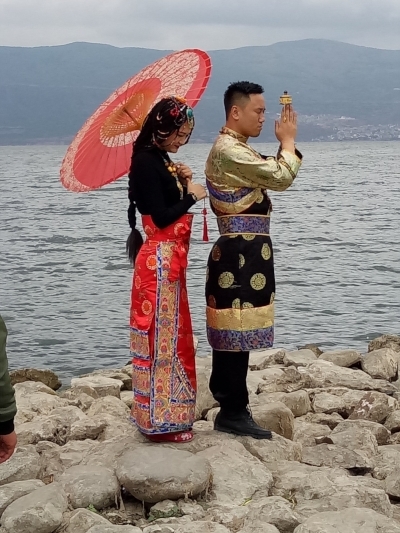 Secondly, Yunnan is a photographer’s paradise: as well as the stunning landscapes, everywhere was bustling with couples in wedding or tribal outfits accompanied by dressers and photographers; it is no surprise to learn that wedding photography is the largest growing profession in the area. Most old settlements have been revived, but many with an all out commercialism of their “Old Town” areas. Sadly, far from preserving working models of a bygone era, they are jammed full of franchise foods, ‘tasteful’ fast food signage and repetitive offerings from t-shirts and tribal clothing shops. Nonetheless, Old Towns with their tea houses, gift and coffee shops, wifi-ready noodle shops and reggae bars offer a good half day’s entertainment. While some of the best food can be had from street stalls and side street cafes almost everything you try, buy and consume is local in some form or another. 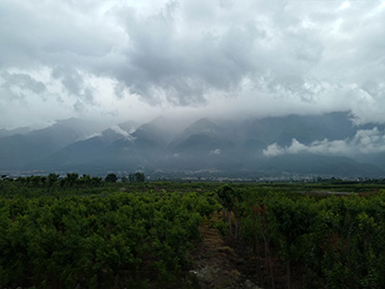 Lastly, you will recognise Heilongtan Park in Lijiang as that place: it has all those familiar bridges, views, picturesque weeping willows, snow capped mountains in the distance on a clear day, and the reminiscence of legends, warriors and movie myths of ancient China. From Monkey Magic to Raise the Red Lantern and the Peony Pavilion there is a wealth of fantasy to see in the mists of the Black Dragon Pool and its luscious, landscaped surroundings. Nearby Dali Lake is also instantly recognisable with its vast stretches of glassy water and huge open skies to stand under - and is always swarming with brides in white, grooms in tuxes treading in mud and newly-marrieds balancing on tree trunks to impress with images of prenuptial bliss. All this is the postcard, the selfie shot and the iconic images, but Yunnan has plenty of other, more authentic culture to offer as well. From Dali we took the train to Lijiang and then a bus to Shuhe about thirty minutes along very good roads. All the roads in Yunnan were well maintained, but don’t expect to see much English signposting. In Shuhe we were welcomed to the Park Hotel Django on the outskirts of Shuhe Old Town by host Slim Rothaus and his wife. Slim is a man of acknowledged musical talent who between gigs and musical projects in New York and West Africa runs the hotel. It sits on the edge of a pure water spring by a Tibetan Buddhist Temple and provides the most eclectic, comfortable and quirky accommodation imaginable. Music and arts feature heavily, with drums, piano and guitar in the corner of the bar. A growing group of musicians congregated from mid afternoon to midnight to play jazz, blues, bluegrass, bebop, and country rock as well as traditional local Yi music. At Django you can also learn plenty about the area, and what really happens beneath the ‘Old Town’s’ tourist facades. One recommendation was to visit Baisha, a traditional Naxi village some ten kilometres away from the hotel. We arrived on a rainy, misty day and the mood was perfect, no tourists in sight, and not one selfie stick. After wandering the streets admiring the ancient murals and Dompa hieroglyphics we entered the Baisha Naxi Embroidery Institute. There Esta, a local embroiderer, guided us through the school and its rooms full of hand-made embroidery. Esta explained the mission of the Baisha institute is to save, protect, and promote the inheritance of traditional Naxi embroidery. It is one of the oldest forms of its kind in the world and uses a fine thread and tiny stitching to create images of incredible detail – some of the ancient Buddhist thangkas, others commissions for modern day corporate logos. Some of the women who embroider are migrants from lower villages, relocated following the flooding of the Yangtze. They learn a craft they can take home as well as creating a micro industry for income and the continuation of a highly valued and once-endangered art form. In sharing the story of the embroidery Institute, Esta also explained Dompa beliefs that include, rationally, the belief that after descending to hell to make amends for wrong doing everyone goes to heaven. The attraction to sign up and learn was strong, and I was able to imagine myself sitting wordlessly for hours over intricate patterns, content with the contents of a flask of tea and the knowledge that any accomplishment would be not just material but also spiritual. It was a profound moment. We stopped for lunch in a dark and cozy wooden building. On arrival we were served an entree of grey jelly-like substance with chili and crispy basil. It didn’t look at all appetising but the taste was really quite pleasant. Naxi food has Tibetan influences and uses clay pot cooking to make the most out of limited ingredients. A steaming hot pot was filled with chunks of pork meat, local Celtus cabbage and sheets of tofu. Side dishes of moist and crispy Yunnan ham were served with fried basil, steamed rice, morning glory and a spice mix of Szechuan pepper, ground peanuts, chili and shallots. After, we visited the famous Dr Ho, a gentleman of advanced years who was joined in his shop by his wife and his son. There are four generations of doctors in the family and Dr Ho, acclaimed Chinese herbalist, has yellowing clippings from magazines and newspapers about his work strewn across the workshop. He imparts snippets of wisdom to visitors while his son, Dr Ho Junior, takes others on a guided tour of the herb gardens and botanical depository. Ho Junior is as every bit as eccentric as his father; both have a good head of hair, strong teeth and offer living testaments to the power of herbs in the diet. The next day we rounded up our experience by driving into the wide open spaces and tundra of the Jade Snow National Park, to the accompaniment of modern Mongolian fusion music from Hanggai, and the haunting sounds of Mamer, a Kazak musician from Xinjiang. We roamed on the plains, arms wide and embracing the wildness and freedom of the land. Until, that is, some quad bike riders bounced over the hills waving selfie sticks, presumably in pursuit of the “ultimate tourist experience”. The visa process for visitors to China can be a little tedious. Everyone needs a visa, and the photo guidelines demand strict adherence, no earrings, no smiling, hair tied back, one colour only. As China is not part of ASEAN, all South East Asian passport holders must have a visa in their passport on arrival. Our trip flew into Kunming from Bangkok on Shandong Air, and returned on Air Asia. Other airlines fly to Kunming from Beijing, Shanghai or Hong Kong. Kunming station serves a range of clean, efficient and comfortable trains, booked through online booking agency DIY China. Drivers can usually be hired through hotels or guest houses; in Dali the hotel manager offered to drive us. Navigation can be through Google Maps, although you will need a virtual private network (VPN) to connect. In fact, a VPN was essential plus it allows visitors to access Google Translate for conversations and requests. We held conversations, found banks and shared musical inspirations and maps through our mobile phones. Many use the WeChat app to communicate with new Chinese or resident Chinese friends. Esta at Baisha Embroidery Institute, Baisha Village, Lijiang District. Tel: 13095230065. Dr Ho Chinese Herbal Institute, Baisha Village, Lijiang District. Joe, Josh, Nee, Tao Ping and an unnamed artist at Django Guest House. Download Gaia Guide on responsible travel here.